With every Android update, users gain some features and lose some. It may be either due to the decisions taken by Google or by an OEM while customizing the update. Samsung’s Android 8.0 Oreo update is no different on this issue. While the update brings many new features that users love on the Galaxy devices, it also takes away some functionality they care about. When Samsung started pushing out the Oreo update in February this year, starting with the Galaxy S8 and S8+, users observed that the shiny new update disabled the functionality to set contact-specific ringtones for text messages in the default Messages application. The move infuriated many users who care about the ability to identify incoming text messages based on audio cues, and they flooded the company’s help forums to vent their frustration. The forum moderators confirmed that the Oreo update disabled this functionality and promised to forward the feedback to the concerned team. 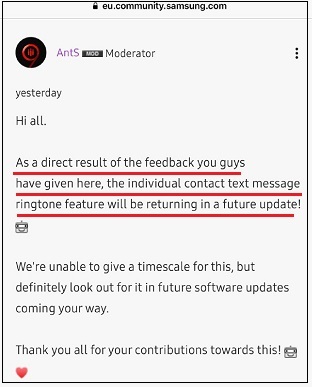 After weeks of waiting, one of the moderators on the company’s European help forum finally confirmed that Samsung would bring back customized text message ringtone feature in a future update. The moderator didn’t offer any timeline as to when this feature will roll out, but given that it’s a minor change, it should be included in one of the security updates in the near future. If you are impatient to wait any longer, you can use one of the third-party SMS apps like Textra or Android Messages on Google Play Store that support this feature. It is possible Samsung might have removed the feature based on the usage metrics but decided to backtrack due to the feedback from a vocal set of users. It is not often that you come across Samsung listening to the customers and making course corrections. In this regard, the company has done well, at least on this specific issue. Update: It appears a system update is not necessary to enable this feature. Samsung is already rolling out an update to the Samsung Messages app via the Galaxy Apps to support individual alert tones. One of the many perks of unbundling system apps and updating them through the app store! If you haven’t received the app update yet, you can download the APK from here. Didn’t even notice that it’s missing as nobody send text messages anymore. I have it and it works fine, I want to have or know if this is also able to do with incoming phone calls for specific contacts. I just installed the latest Messages app from the link you provided but nothing changes in regards to the custom notification. I’m using Oreo 8.0 on a Samsung S7.